Earn money as a venue host. 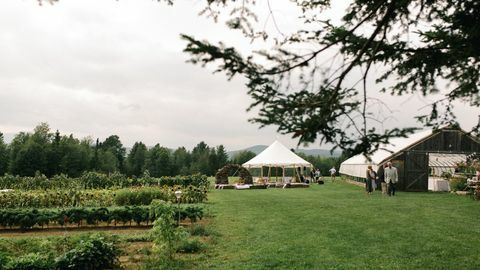 Mayflower Venues' team of marketing experts promotes your property to engaged couples looking for unique & nontraditional wedding venues. Why list on Mayflower Venues? Couples want to book and manage their weddings online. Our tools and technology make your venue attractive to thousands of couples looking for a technology-enabled yet unique and nontraditional venue. Learn how much you can earn by starting your application today. Tell your story and share the basics of your property. A Venue Host Success Partner will contact you within 48 business hours to review the details of your property and determine whether your property is a good fit. Our team of marketing experts will craft a custom listing for your property optimized with the most popular search criteria. Using our matching algorithms, we’ll get your property in front of the right couples looking for exactly what your venue has to offer. As your venue gains traction, we’ll uniquely qualify each couple to ensure mutual fit before sending a tour or booking your way, saving your time and effort for only the most high intent couples. When you receive your first Mayflower Wedding booking, a Mayflower Venue Logistics Specialist will visit your property to onboard your venue. Mayflower will then work with your booked couples to enable successful event execution. You'll have visibility over each event’s progress within your host account and receive payment within a week of the event. We’re here to enable outstanding experiences for our hosts and couples. To further demonstrate this commitment, each event is backed with a $1M special event insurance policy covering our hosts in the unlikely circumstances of property damage, liquor liability, or bodily injury caused by couples or their guests. We'll represent your unique property rules and ensure they are communicated to each couple. We then screen each lead to ensure they are comfortable with your rules before processing a wedding booking request. Mayflower Venues’ matchmaking process guarantees that the right couples are matched with your venue so there are no surprises. Does listing my property cost me anything? Nope. Nothing. We create, list, and market your venue listing for you. All you do is wait for the perfect couples to come along and book your wedding venue. We process payments quickly. Expect payment less than a week after a hosted event. Can I also list any overnight accommodations I have along with my venue listing? Absolutely! Couples love having the option to stay on site during their wedding weekend. Offering lodging is a great way to increase your property’s value. Can Mayflower Venues help me choose a price? Of course! Our proprietary pricing algorithm determines the best listing price to maximize your profit. Can I keep the original name of my venue? We qualify each couple before touring your venue and to protect our host’s privacy we anonymize venue name to prevent unwanted drop ins. I’d love to work with Mayflower Venues but I don’t see other properties in my area. What do I do? We’re growing quickly and expanding to new regions. Please fill out the form and we will be in touch as soon as we’re preparing for a launch in your area. The higher you are on the waitlist, the sooner your property will list if approved. What if a couple contacts me directly? No problem. Mayflower generally serves as your exclusive booking platform. If a lead reaches out to you directly you can simply connect them with your Mayflower Representative who can run the couple through our lead qualification process. Once they are ready to book, we’ll let you know and include a host referral bonus on the spot to compensate you for the lead. Can I set my own availability schedule? Yes! Mayflower Venues Hosts manage their own availability. You can host as few weddings as you want per year and block off any dates that won’t work for you!